Vindale Research Review 2019: Is Vindale Research a Scam or Legit? With so many paid survey sites out there, you may be wondering which sites are worth your time and which ones you should avoid. 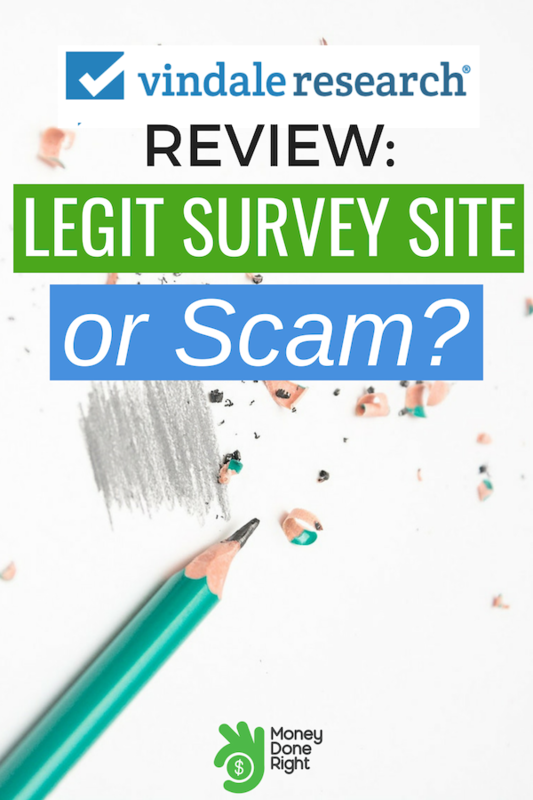 We all love making money online, but there are some sites that either pay very little for surveys and opinions, or they’re complete scams. We’ve decided to research the paid survey sites so you don’t have to waste your time trying various sites to find the best ones. When it comes to paid survey sites, Vindale Research is a trusted and reliable research marketing firm where top companies can get valuable consumer insights, and consumers can earn cash for taking part in product surveys and case studies. If you’re new to making money online, taking surveys is a great way to start. You can pick and choose the hours you want to work and there are typically plenty of surveys to take that will pay you real cash. Here’s our Vindale Research review where we spill the beans on whether or not Vindale is a good paid survey site. Vindale Research is invested in gathering quality information and data for the companies they partner with, meaning the surveys and activities you participate in have a real impact on these companies. Founded over a decade ago, Vindale Research offers paid surveys for consumers in the United States, the United Kingdom, Canada, and Australia, and there are plans to expand their already large global footprint. Vindale Research is a well-established research company that partners with some of the top businesses around the world, including Netflix, Disney, Amazon, and Verizon, to name a few. These companies partner with Vindale Research to conduct surveys, product testing, case studies, and so much more, and they’re paying consumers top dollar for their opinions. In fact, the site has paid out almost $7 million to date, and that number is growing every single day. One of the best parts about this site is that you’re paid in cash. While most survey companies have a reward points system, Vindale Research pays you out in cash via check or PayPal, so you don’t have to worry about converting your points into gift cards or merchandise. In addition to being able to take surveys on your computer, you’ll be able to participate in surveys and studies on the go with the Vindale Research app. This survey site offers a wide range of surveys and other activities that can earn you money, making it a top company in the paid survey research industry. Click here to sign up for Vindale Research today to start earning money by completing surveys. Vindale Research is extremely straightforward and has a very easy to use interface. Once you sign up for the site, you’ll complete a demographics questionnaire that will expertly match you with relevant surveys and activities. You can decide to browse their current paid survey offerings and you can have relevant surveys emailed to you every day. When you find a survey you’re interested in, you’ll be asked some pre-screening questions to see if you qualify for the survey. If you elect to have surveys emailed to you every day, the questionnaire algorithm tries to send you surveys that you’ll qualify for, meaning you don’t have to waste your time just trying to qualify for specific surveys. These surveys are some of the highest paying surveys in the industry, and most of them can be completed in under an hour. You’ll find surveys that take just a few minutes that might pay out an average of $1, and you’ll find plenty of surveys that take 30 minutes or more that are paying well over $10. If you dedicate some time to taking surveys on Vindale Research, there’s an opportunity to make a lot of money just by telling companies your opinion. Since Vindale Research partners with so many top companies around the world, you’ll have access to hundreds of paid surveys on the site every day. New surveys are uploaded constantly, and by remembering to turn on email updates with relevant surveys, you can have tons of surveys sent right to your inbox so you don’t have to spend time browsing the new surveys. With the updated Vindale App, you’ll have quick access to countless surveys that you can take on the go, meaning you can earn extra money throughout your day. Whether you take surveys on your phone or on your tablet, earning money online has never been simpler. After you’ve completed your surveys, Vindale Research will pay you in cash rather than points. One of the biggest complaints that paid survey firms get has to do with points systems versus cash payouts. Consumers want to be paid for their time and opinion, and there are plenty of paid survey sites out there that only reward consumers with digital gift cards or merchandise. Vindale Research knows how valuable your time and opinion are, which is why they offer cash rewards for the surveys you complete. You’ll have the option to cash out via PayPal or you can have a check mailed to you. Vindale’s payment processing times are relatively quick, with most payments arriving within a few short weeks, and even shorter if you opt for PayPal payments. While there are tons of paid surveys you can browse on the site or have emailed directly to you, there are also more ways to earn money through Vindale Research than just paid surveys. When you join the Vindale Community, you’ll have the chance to browse their blog and social media pages to find reward codes scattered throughout their content during the week. If you’re lucky enough to find a code, you can redeem that code for cash. This is a great way to keep the Vindale Research community connected both on the site and through various social media channels. They also want that vibrant community to grow, which is why they offer a paid referral program. For everyone that you refer to the site, you’ll be paid $5. When you sign up for Vindale Research, you’ll have the opportunity to generate a unique referral link that you can use to get people to sign up. The more people you get to sign up, the more money you end up making. People love seeing what others can earn through paid survey sites, and so does Vindale Research. If you post a photo with your Vindale payment or a payment sign, you’ll earn $5 for sharing it. All it takes is a few minutes to take a picture of you with your earnings and share it on your social media account. If you spend a lot of time on your phone or your computer throughout the day, you should consider signing up for their paid email program. You can opt in for Reward Mail right in your settings, which allows you to be paid for simply reading emails. With this option turned on, you’ll be sent special promotional emails throughout the day. When you open the email and read it, you’ll be paid. While the number of paid emails you’ll receive each day will vary, it’s a simple and effective way to earn even more money between surveys. Finally, you’ll have the option to earn money through paid videos. You’ll be able to search the site for eligible videos, and there may be times that you’re emailed a link to a specific video that you can watch right on the site. However you get paid, there are never any payment processing fees. As you can see, there are tons of ways to earn real cash rewards through Vindale Research. Vindale Research really sets itself apart from other survey research companies because of the large portfolio of companies that it partners with. Some of the top companies that Vindale Research regularly partners with include Netflix, Disney, Amazon, Starbucks, Nike, and Verizon. It says a lot about Vindale Research when companies like these are choosing to partner for their consumer data. These companies have the manpower and the budgets to launch full analyses into consumer behavior, but Vindale does it so well that they decide to partner with Vindale instead of doing it themselves. That’s one of the main reasons the payments are much higher than industry standards. Vindale Research knows how valuable consumer opinions can be, which is why the company strives to create an exceptional experience when you’re taking surveys and participating in other paid activities. When you sign up for this site, you’re helping shape the future of these top companies. Your opinion can have an impact on what products and services are available, how these companies market their products and even prices for these products and services. We mentioned it earlier, but the application that you can download on your phone or tablet is phenomenal. The app is incredibly simple to use, meaning you can take surveys, watch videos, or browse the Vindale Research blog for reward codes while on the go. Whether you’re taking the train to work or if you’re looking for something to do on your lunch break, this app is a great way to spend your spare time throughout the day. The surveys and activities are fun and engaging, which means that making money online is that much easier. Sign up for Vindale Research today to start earning money by completing surveys. We’ve all heard the stories of companies scamming consumers out of time, money, and their sensitive personal information. We also know that plenty of people can be wary about signing up for sites that require personal information, especially survey sites that require specific demographic information. We are here to put your worries at ease. Vindale Research is 100% safe and is not a scam. We’ve seen countless reviews of real consumers being paid out for their surveys, reading emails, and watching videos. Some research companies lure you in with the promise of high payouts only to get your personal information and sell it to a third-party company. Vindale Research is a legitimate consumer analytics company that partners with top companies around the world to provide real cash payouts for your opinions. In a world where scams are all too common, Vindale Research provides an amazing experience. One of the best parts about Vindale Research is their dedication to keeping your information safe. After Vindale Research collects survey information, your sensitive personal information is scrubbed from the reports that are sent to the companies that partner with Vindale, meaning your information is never going to be compromised. Vindale Research also never sells your personal information to marketing companies and advertising firms. Information security is essential when so much of what we do every day happens online. It’s hard to find a paid survey company that takes information security as seriously as Vindale Research, which is why they’re a top choice when it comes to paid survey websites. At the end of the day, you’ll be hard-pressed to find a paid survey site that is robust and generous as Vindale Research. With hundreds of new surveys posted daily, and with the opportunity to earn up to $50 per survey, you have the chance to earn some serious money by providing companies with your opinion. If you’re looking for a legitimate paid survey site that values your time and opinion, Vindale Research is just what you’re looking for. Whether you’re just getting started taking paid surveys or if you’re a seasoned pro, this site should definitely be on your list.